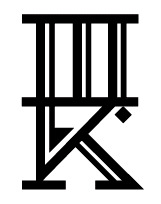 Ten years ago today, Tattoosday was born out of BillyBlog. A decade and 2078 posts later, we are approaching 4 million page views and still puttering along. 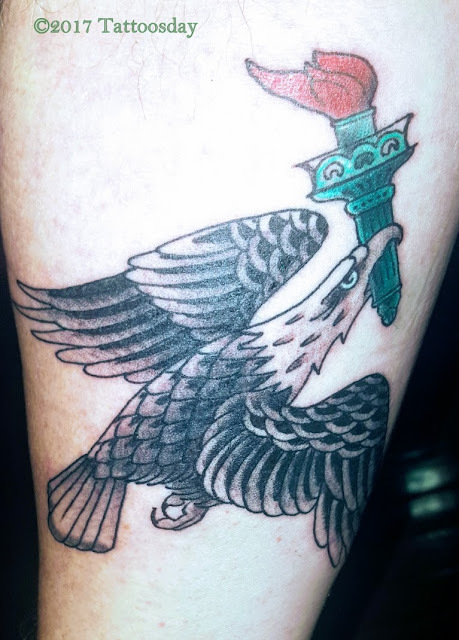 Alex McWatt at Three Kings helped me ring in my 50th year on earth, and 10th year of Tattoosday with this custom-designed eagle with a New York City theme. Stay tuned as we celebrate our tenth year with lots of fun stuff, including visits from some old friends. Thanks to you, our loyal readers and contributors, who have been so kind to us over the last decade! Earlier this summer, I met Florian across from the New York Stock Exchange in lower Manhattan. Each of these three skulls has something unique about them - one had headphones, one has a blindfold, and one has a sealed-over mouth. Florian explained that this was a different take on the "see no evil, hear no evil, speak no evil" maxim of the three wise monkeys. Obviously, these are human skulls, but I love the way the artist transformed the concept into a breath-taking tattoo. The work was done by Roz from Pin Up Tattoo in Vienna, Austria. Thanks to Florian for sharing this amazing tattoo with us here on Tattoosday! I met Brianna earlier this month across from Federal Hall in the Financial District. I generally don't like to take pictures of sleeves, because it's hard to do them full justice, but sometimes they are so interesting, I can't resist. I love the design of this tattoo. Brianna explained that she has always been fascinated by shapes and geometry, and the hexagram in the top photo features a segment of spine, which is a nod to the fact that she has dealt with spinal issues since she was a child. She credited this work to Lacey Burnett at Twisted Anchor Tattoo (@twistedanchortattoo) in Ocean Springs, Mississippi. Thanks to Brianna for sharing her cool sleeve with us here on Tattoosday! Gabriella credited her work to Olivier Desrochers (@olirockstattoo) from Imperial Tattoo Connexion (@imperialtattooconexion) in Montreal, Canada. 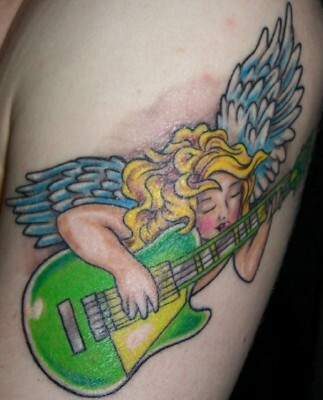 Thanks to Gabriella for helping us honor the memory of Amy Winehouse here on Tattoosday! 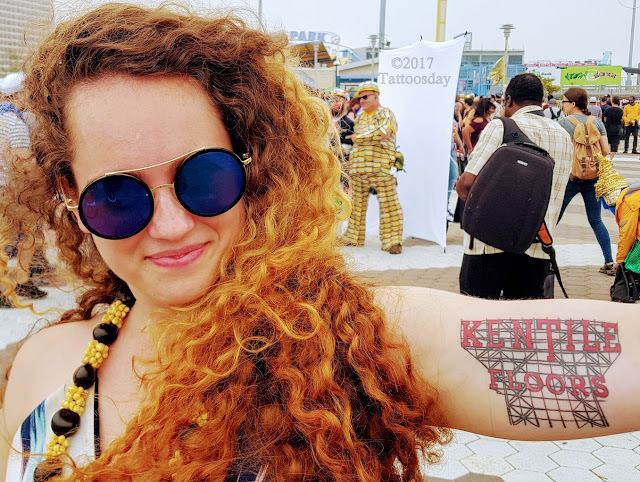 Last month, at the 35th annual Coney Island Mermaid Parade, I met Sierra, who was kind enough to share her appropriately-themed tattoos on her sides. She credited this work to Siege (@siegeart) from Revival Art Collective (@revivalartcollective) in Phoenix, Arizona. This one she credited to Moeh Haywood (@Moehskee) who tattoos out of Crimson Hilt Tattoo (@crimsonhiltattoo) in Denver. 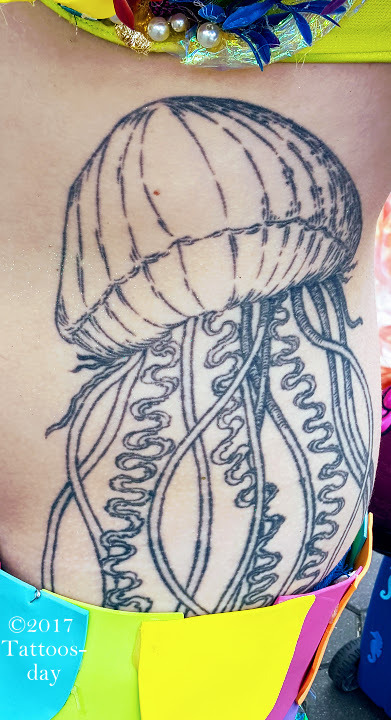 Sierra told me the jellyfish and octopus tattoos are a nod to the fact that she studied marine biology. 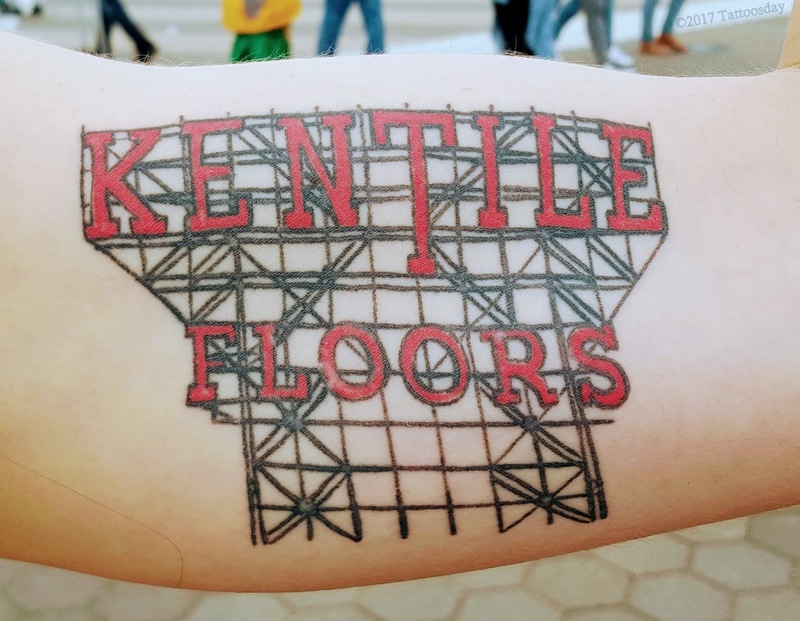 Thanks to Sierra for sharing her cool tattoos with us here on Tattoosday! Sandy told me, "I'm actually doing a foot-to-shoulder piece. I'm gonna do water, then land and sky and it's basically things that I'd done with my husband who passed away, so it's kinda like a tribute." This work was done by Frankie Oneshot (@frankieoneshot) at Bullseye Tattoos (@bullseyetattooshop) in Staten Island. We're hoping that we'll be privy to more of Sandy's work in the future. 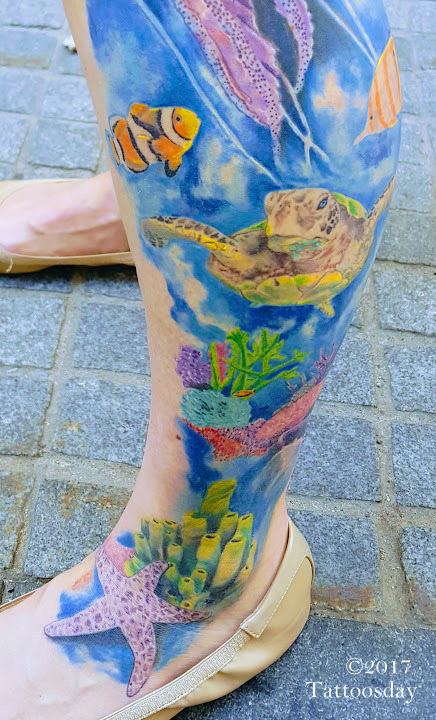 Thanks to Sandy for sharing her awesome sea leg with us here on Tattoosday! 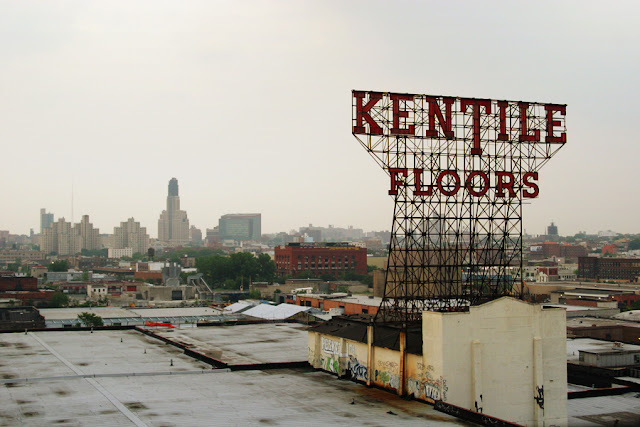 For those of you unfamiliar with the Kentile Floors sign, this was a highly visible landmark perched high over the Gowanus Canal in Brooklyn. Louie Ozomek (@louiescustomtattooing) at Hand of Glory Tattoo (@handofglorytattoo) in Brooklyn did a nice job replicating the sign on Emory' biceps. The sign was dismantled in 2014, but Emory wanted to "preserve its memory" on her arm as a tribute to the familiar symbol that stood in Brooklyn for sixty-five years. 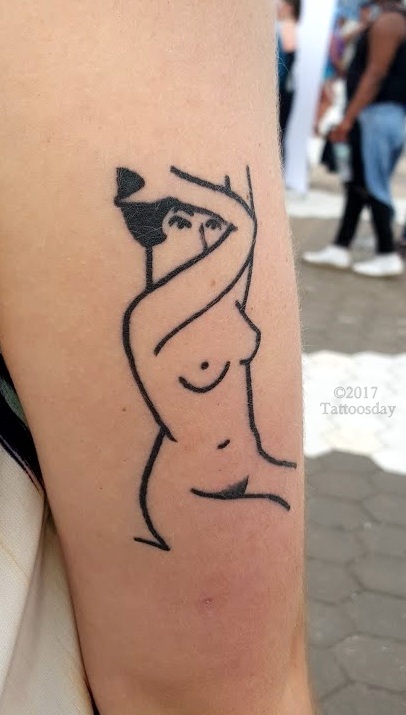 She got this at Magic Cobra Tattoo Society (@magiccobratattoo) in Brooklyn, as part of a fundraiser called Party to Protect, in support of Planned Parenthood (@plannedparenthood). 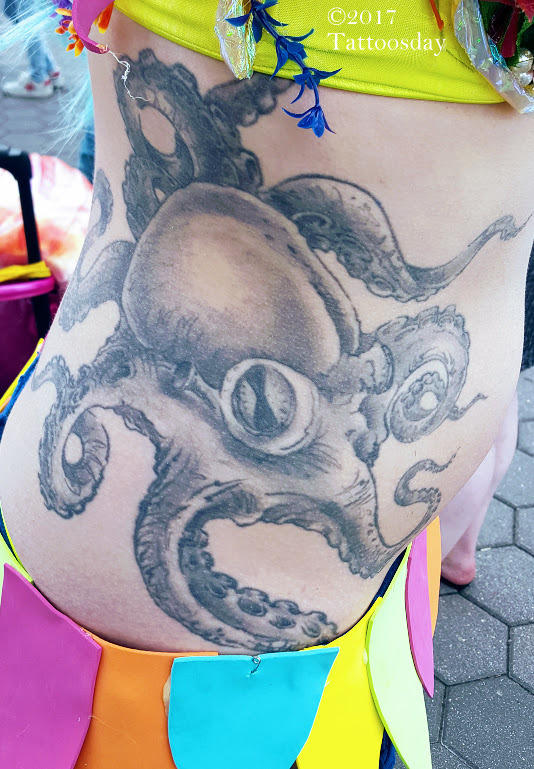 Thanks to Emory for sharing her cool tattoos with us here on Tattoosday!